Republicans won in Arizona last night. But the margin should scare them. WASHINGTON — Well, we told you to watch the margin in last night’s AZ-8 special election. And what happened? 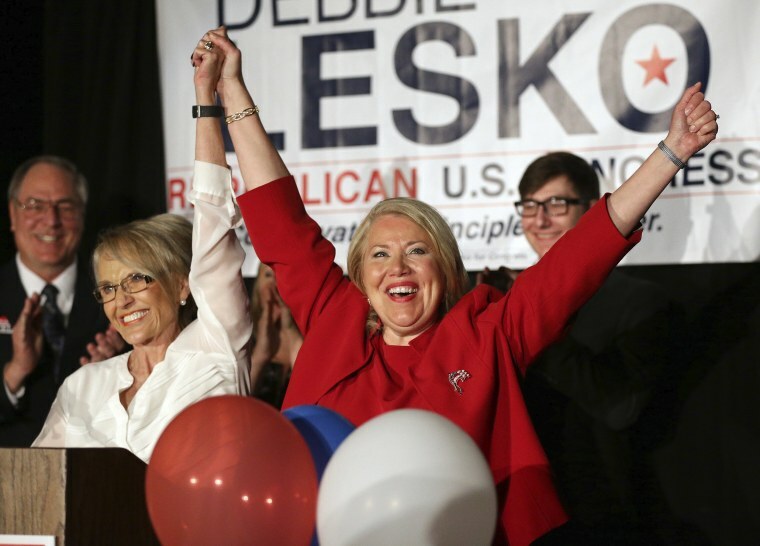 In a district that President Trump carried by 21 points in 2016 — and which Mitt Romney won by 25 in 2012 — Republican Debbie Lesko pulled off a 6-point win over Democrat Hiral Tipirneni, 53 percent to 47 percent. Yes, a win is a win. But that 15-point Democratic overperformance from the 2016 presidential election is greater than the Dems’ 12-point average in the previous eight major contests of 2017 and 2018 (KS-4, GA-6, MT-AL, SC-5, NJ GOV, VA GOV, AL-SEN, PA-18). And if Democrats are hitting 47 percent of the vote in a heavily GOP-leaning district like AZ-8 — without a scandal-plagued GOP nominee (like we saw in Alabama), without an exceptional candidate (like Conor Lamb in PA-18), and when the GOP outspends them by about $1 million to $0 in national party money — that suggests they’re set up well for November’s statewide Senate contest in Arizona, as well as dozens of House races across the country. As the Cook Political Report’s David Wasserman put it: “There are 147 GOP-held House seats less Republican than #AZ08. It's time to start rethinking how many of those are truly safe in November.” Now that doesn’t mean that 100-plus GOP seats are in jeopardy – open seats are harder to defend than incumbents, and Republicans are going to have plenty of money to spend in the top-tier races. GA-6 in 2017 (initial round): Jon Ossoff 48%, Karen Handel 20%, Bob Gray 11%, Dan Moody 9%, Judson Hill 9%. If you wanted a microcosm of the chaos and controversy of the Trump Era — over something that SHOULD be so easy — look at the difficult time Team Trump is having filling the position of VA secretary. Controversy? Check. A lack of message discipline? Check (“If I were him … I wouldn’t do it”). The White House still defending him anyway? Check. All over a vacancy that necessarily didn’t have to happen in the first place? Check. Talk about Kinsley gaffe. And talk about handing a powerful quote to the Democrats to use on the campaign trail.